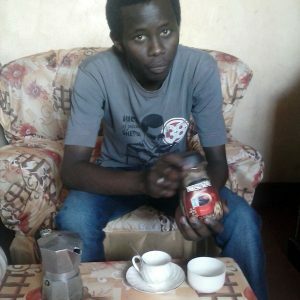 Late last year, Basil Lengusuranga, pictured, a young man from Kenya, commented on a Baristador Coffee blog. It was quite a surprise that someone from the nation that I believe grows the best coffee in the world was engaging on my humble website. It was doubly pleasing because I use Kenyan coffee in my Baristador coffee blends. Basil agreed to answer a few questions about his attitude toward and use of coffee. Q: In Australia, many of us who love coffee have a deep respect for Kenya, as one of the nations where African coffee is of the highest order. Are you a coffee drinker? Q: What role does coffee take in your life – nothing, just a drink for its caffeine, a drink of great flavour? A: It plays a very important role in my life since as a student it fights away the dizzyness in me and keeps me active all day. Q: Do you drink Kenyan coffee? Is it cheap or expensive in Kenya? A: I drink Kenyan coffee. Q: Is Kenyan coffee well regarded in Kenya, or do you hold other national producers as ‘the best’? A: In fact, in Kenya we don’t import coffee from any other country. Ours is regarded best. Q: Do you know anybody involved in the coffee business – growers, pickers, roasters, retailers, baristas? Do you have a sense of whether they love their roles or are just doing them to survive? A: I know of the large farmers in Nyeri [who] are now millionaires because of just involving in coffee growing. Q: Any stories about coffee that you would like to share? Q: How do you make or drink your coffee? A: We boil hot water, then we put them in cups, add a spoonful of coffee of your choice, stir, add some sugar, and now its ready.